Biker #2: I say we kill him! Biker #3: I say we hang him, then we kill him! Biker #4: I say we scalp him! Biker #4: Then we tattoo him! Biker #4: Then we hang him! Biker #4: And then we kill him! Pee-wee Herman: [trying to throw voice without moving lips] I say we let him go. Biker Mama: [whistles] I say you let me have him first! Dottie: Don't you want to see the rest of the movie? Pee-wee Herman: I don't have to see it. I lived it. Dottie: I was wondering if you would go someplace... with me. Pee-wee Herman: Look, Dottie, I like you. Like! I like you! Pee-wee Herman: [shouts] Dottie! [calm voice] There's a lotta things about me you don't know anything about, Dottie. Things you wouldn't understand. Things you couldn't understand. Things you shouldn't understand. Pee-wee Herman: You don't wanna get mixed up with a guy like me. I'm a loner, Dottie. A rebel. Francis Buxton: Today's my birthday and my father says I can have anything I want. Pee-wee Herman: Good for you and your father. Francis Buxton: So guess what I want. Pee-wee Herman: A new brain! Francis Buxton: No. Your bike! Pee-wee Herman: I want to speak to Francis! Pee-wee Herman: Busy doing WHAT?! Pee-wee Herman: Oh, REALLY? WHERE ARE THEY HOSING HIM DOWN?!! 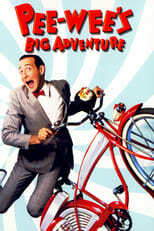 Pee-wee Herman: STILL wanna ride my bike, Francis?!! Francis Buxton:: No! NO!!! I don't want your crummy old bike!! Pee-wee Herman: AHA! You don't want it anymore BECAUSE YOU ALREADY HAVE IT!!! TELL ME WHERE IT IS BEFORE I LOSE PATIENCE WITH YOU!!! Pee-wee Herman: Shhhhh! I'm trying to use the phone!! Biker 1: Did anybody tell you that this is the private club of the Satan's Helpers? Pee-wee Herman: Nobody hipped me to that, dude. Biker 1: It's off limits! Kevin Morgan: Well, is everything straightened out? Jerry: We are whenever you are. Kevin Morgan: Doesn't it look like I'm ready? [loudly] I am ALWAYS ready! I have BEEN ready since first call! I AM READY! ROLL! Jerry: Quiet, please! This is a take. Roll, please. Pee-wee Herman: Chris, what is this? Too late! Chip? Chip: Uh... it looks like a pen. Pee-wee Herman: Correct! This is the pen I bought exactly one hour before my bike was stolen. Why? What's the significance? I DON'T KNOW!!! [as hotel desk clerk; in deep voice] Paging Mr. Herman! Mr. Herman, you have a telephone call at the front desk! [falls off bike after attempting tricks] I meant to do that! Go ahead and SCREAM your head off! WE'RE MILES FROM WHERE ANYONE CAN HEAR YOU!! !